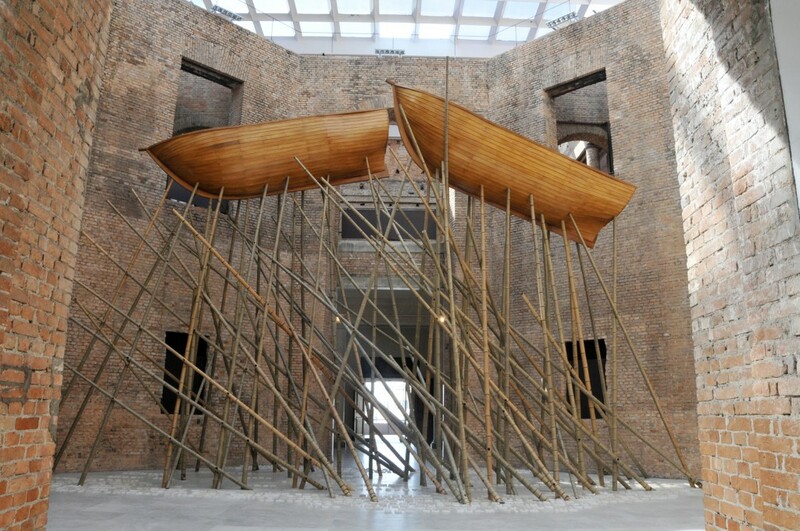 Above the entrance of the octagon at Pinacoteca, two wooden boats, each six meters long each, are suspended by bamboo outriggers. Looking at this imposing, asymmetrical and undulating structure, seemingly strongly moored, is dizzying at first, as it inverts our perspective to the “deep of the sea” instead of what would normally be the “surface” of an exhibition. This installation, “TIAMM SCHUOOMM CASH!”, by the painter, draftsman, engraver, sculptor and professor José Spaniol, opens the Octagon Project calendar of 2016. Developed by Pinacoteca in 2003, the project focuses on presenting new site-specific works as well as remakes of important past ones, and its past exhibitions include artists such as Mario Merz, Artur Lescher, Joana Vasconcelos, Rubens Mano, Carlito Carvalhosa and others. 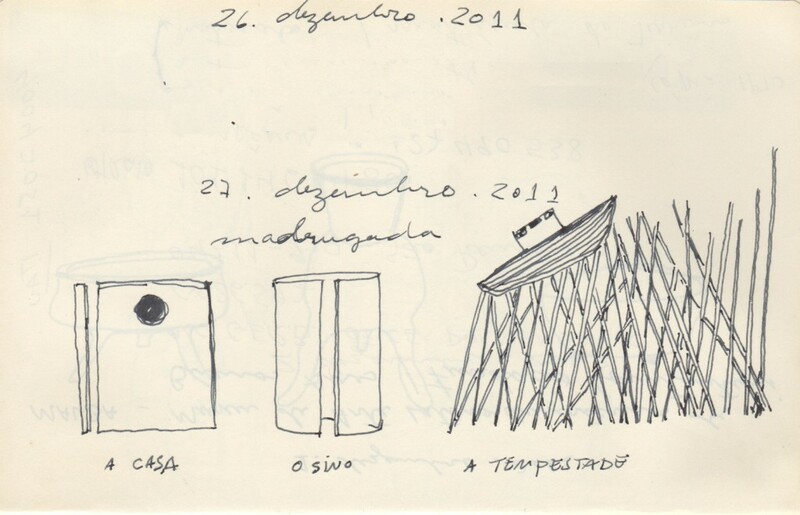 Born in São Luiz Gonzaga, Rio Grande do Sul in 1960, Spaniol devotes his practice mainly to space research and verticality limits. Since the 1980s, when he left the canvas and engraving behind, the artist has developed sculptures and installations using ancestral traditions and popular materials and procedures, reinserting them into contemporary discourse. 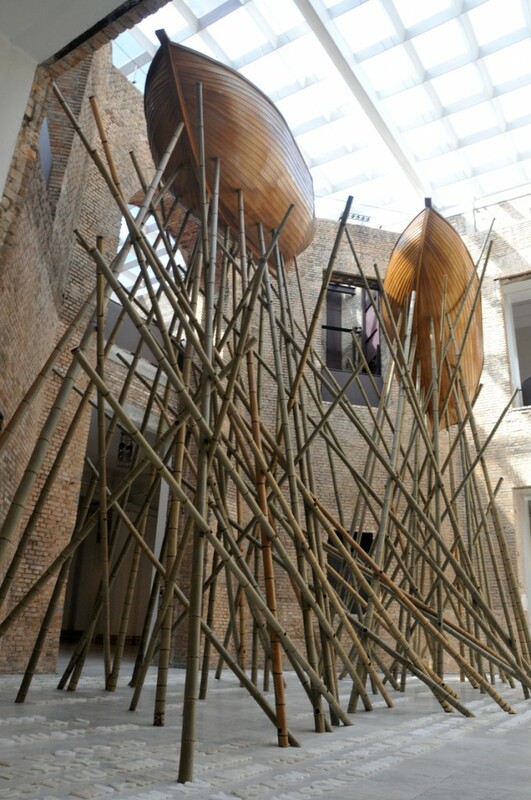 The relationship between sculpture and architecture is present in the work of Spaniol, here revealed in a game between the bamboo, which references seemingly fragile Oriental buildings, and the sturdy brick walls of the museum. The structure also uses onomatopoeia, in the title of the show as well as in the work itself, via melted paraffin that mimics the sounds of water when voice-activated. Although composed of heavy structures weighing nearly a ton, the work evokes a strong immateriality both in the sounds of words waiting to be pronounced, as well as in the invisible maritime “breeze” that is projected in space vibrating the set. The boats, whose shapes resemble Portuguese caravels, recall the pioneering human impetus to renounce the land for the sea and all its enigma and the power of nature.